Galaxy Mall Asansol is a mega mall, a lifestyle hub - a place to shop, catch the best movies, eat out and generally have a great time. A mall so grand and vast, it will effortlessly match strides with any of its Kolkata brethren - in features, glamour, recreation, shopping pleasures, and a whole gamut of other star-studded attractions. - Area: 3 lakh sq.ft. approx. The RCC structure at Galaxy will be reinforced with P.T. Beams. These will reduce beam depth and span over larger floor areas, and ensure greater floor height. The landscaping gives Galaxy a refreshing feel. The place will be flanked by open space and gardens. Trees on the south and west will not only provide shade, but also shield the building from direct sunlight, noise and air pollution. Here is another food for thought from Galaxy. On the fourth floor of this mega mall, the tongue will go for a twist. This floor will have a galaxy of food options, for every whim and preference. It will have a food court for more than two hundred people and a hundred twenty five plus seater continental restaurant. For informal addas there will be a coffee bar, for formal gatherings a banquets-conference hall. The multiplex exits on this floor will ensure a deluge of further footfalls. The latest stars will always play at Galaxy. 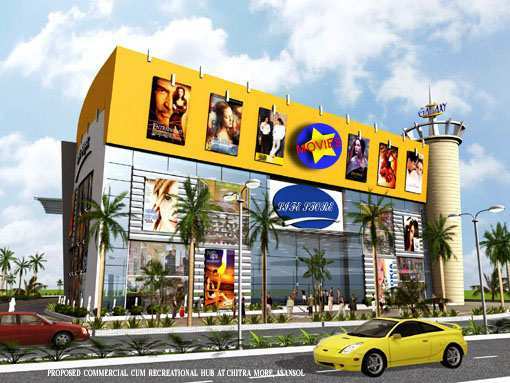 The fifth floor of the mall will have a state-of-the-art three-screen multiplex, with accommodation for more than eight hundred movie buffs. The level will have separate entrances, every facility and amenity for the cine lovers. A grand view, of the atrium and skylights, will also be its added attraction.